For us pet owners, one of the worst parts of the day is leaving our furry friends behind so we can go to work. Worse still, some pets don't handle being alone all that well, and take to destroying items around the house. While some cats may just let themselves out, not all other animals are content with sleeping in the house, so it's time to give your faithful companion a friend of its own. DarwinBot is an experiment by Jordan Correa, a test developer at Microsoft's Robotics Group. 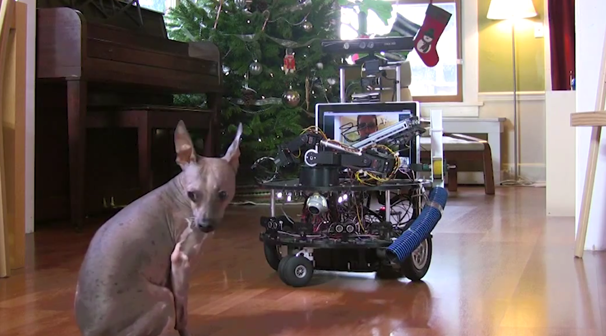 He was looking for a way to test out the Microsoft Robotics Developer Studio 4 development tool, and decided to try out the most recent updates on his dog, Darwin, who needed some comfort and distraction while his owners were out. The robot allows Jordan to remotely interact with Darwin over the Internet. The little robot now has audio output and can show Jordan on the screen via Skype, so Darwin can see and hear his master. It also has ways of entertaining him too, like a ball-launcher and an arm that throw and retrieve a dog ball. Jordan can move DarwinBot around by navigating with an Xbox controller, and make it dispense treats. Pretty awesome. All of this is possible thanks to Robotics Developer Studio and a hardware platform called Parallax EDDIE. The launcher is made out of a racketball ballista, and it has a panning camera near the arm for looking around. A Kinect camera on top of DarwinBot helps you avoid obstacles while you steer the machine around. The one thing the robot appears to be missing though is a poop scoop, though maybe that's something for a future version. While DarwinBot is really cool, if you want to keep your pet entertained all the time you are gone, you would have to stay connected while you are at work, which would probably be a big distraction to tasks at hand (although a nice one!). Perhaps the robot can be further developed to do certain actions at set periods of the day, even when you can't play.